This is a great hut for people who don't want a far approach, but want to be able to get some great skiing in. There are plenty of peaks around the hut for mid-winter skiing, but there are some really fun lines for spring skiing. 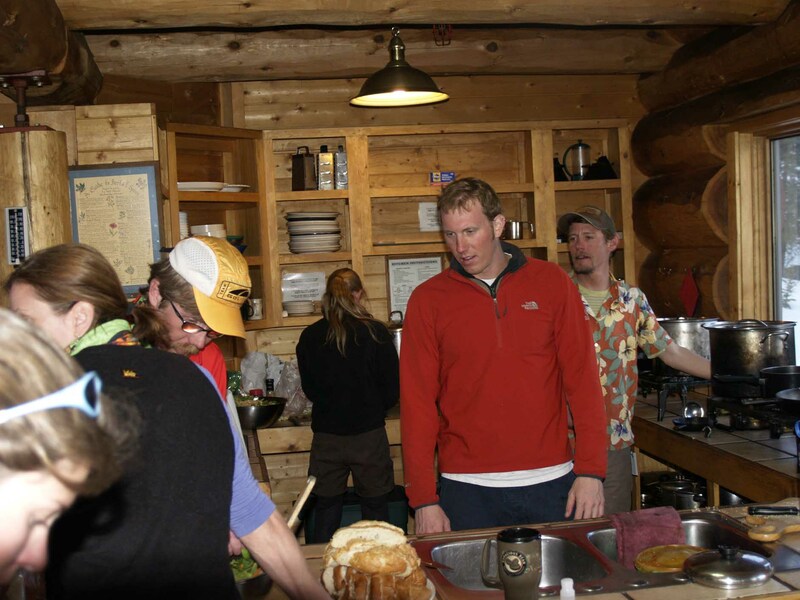 The hut is surrounded by Peak 10 of breck, Crystal Peak, Father Dyer, Herb's Bowl, and other good peaks and couliours. Owned by Summit Huts Association, Francie's Cabin was built in 1994 in memory of Frances Lockwood Bailey. Hut Location: Francie's Cabin is located in the Arapaho National Forest, in central Colorado, about 5 miles southwest of the town of Breckenridge. Layout and capacity: Downstairs: 1 bedroom with 1 single bunk and 2 single beds Upstairs: 5 small bedrooms (2 have 2 single beds and 3 sleep 4 each in bunks). Summer capacity: 20. Winter Capacity: 20. There is a sauna, as well as indoor composting toilets, so no need to go outside. The deck gets plenty of sun for spring visitors! To get to the hut in the winter, the easiest way is to park at the Spruce Creek Trailhead, and head up the Spruce Creek Road. When you get the first gate after a couple of hundred yards, stay to the right. Continue on the road, until you get to another intersection. Stay on the road and head to the right wherever possible. After about 1.6 miles, you will get to another intersection with signs telling you that there is limited snowmobile access. At this intersection, continue straight and go up the hill. You will reach a clearing, and you will see blue diamond trail markers. Turn right when you reach the clearing, and you will see the hut in a couple of hundred yards. There is snowmobile access to thte gate up Spruce Creek Road. Access is limited to the road only, which will not get you directly to the hut.